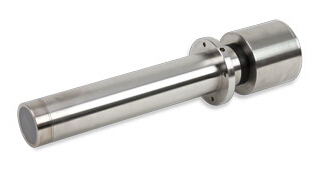 Hydro-Probe SE - sensor for moisture in liquidsThe Hydro-Probe SE is a high temperature microwave sensor designed for use in liquids such as concentrates, solutions or any process where the level of moisture or dissolved solids requires measurement. The sensor is manufactured from materials that are safe for food contact enabling installation in food production or similar environments. Typical applications include measuring in an evaporator when reducing liquids to determine when a target level has been reached or any process where an exact measurement of moisture in a liquid is required. Designed for installation in a pressurised environment, the sensor is positioned so that the material flows around the sensing head and measurements are taken 25 times per second. The sensor rapidly detects changes in moisture levels enabling real time adjustments to be made during processing. This ensures that the manufacturer is able to produce a consistent product which is always maintained to an optimum condition for the next stage of the process. This improves quality and efficiency and reduces waste and cost. The Hydro-Probe SE incorporates the unique Hydronix digital measurement technique for extreme precision and also provides a choice of measurement modes allowing the user to select the most appropriate mode based on the material being measured. The sensor is also equipped with on-board functionality such as configurable digital inputs and outputs, signal smoothing, batch averaging and high and low moisture alarms. This versatile moisture sensor may be used as a stand-alone unit with a display such as the Hydro-View, or easily integrated with a third party automation system using the analogue and digital communications.